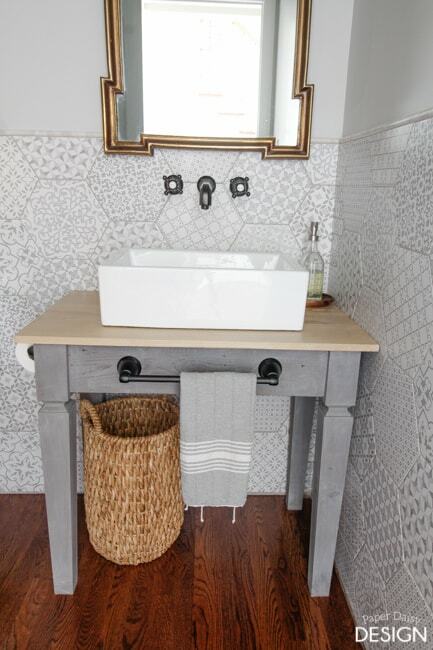 This little vanity table is more than just a pretty addition to our powder room, she’s a true heavyweight. 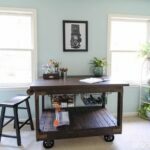 Initially, the vanity was going to support a vintage sink that weighed nearly 60 lbs, and I had wanted an oak vanity unit, I searched for an Oak Vanity Unit Online that could stand the 60 lb sink but to find one that sturdy was going to cost a fortune so in the end building an antique-inspired table that could withstand that constant weight was essential. Because of the limited space, I had very specific dimensions to adhere to. And as much as I would have loved to find the perfect antique washstand or table, I didn’t have time to hunt one down. 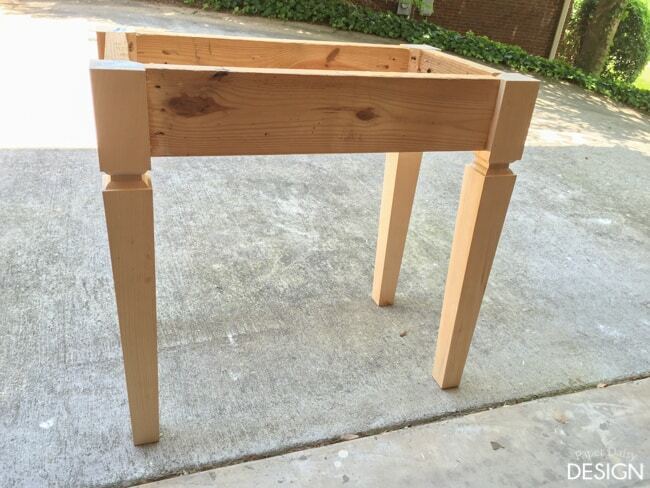 Once I decided to build my own, I searched out table legs and found these beauties from Osborne Wood Products. 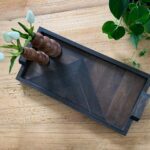 They are simple, yet they have some nice detail and were not a farmhouse style, which I was trying to avoid. They were also sturdy and could be ordered in the perfect size needed for my vanity. Here is the original vintage sink I was going to use. 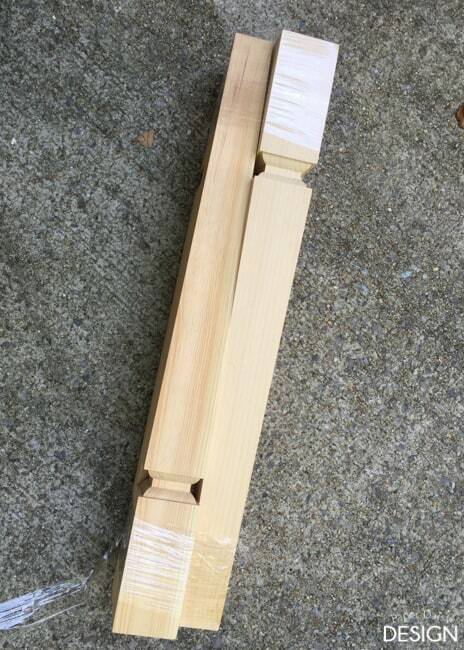 It was extremely heavy and is actually why I designed and built the table to be so incredibly sturdy. But once the table was built and we moved it into the space, I decided the look was all wrong. 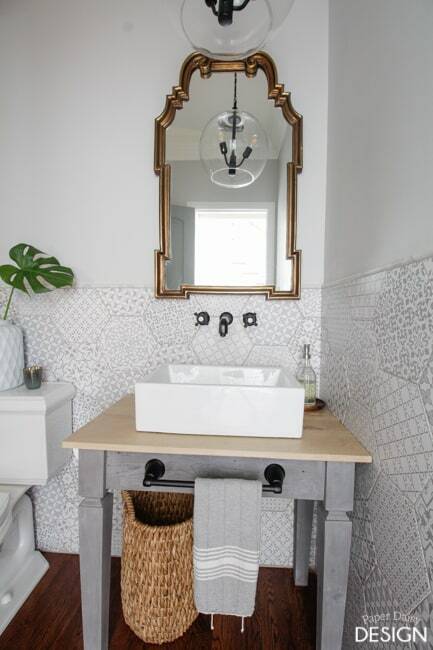 The antique wall mounted sink just looked odd sitting on the table. 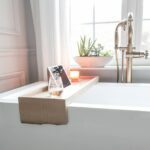 I searched out a new rectangular sink as a replacement and was much happier with the more modern choice. 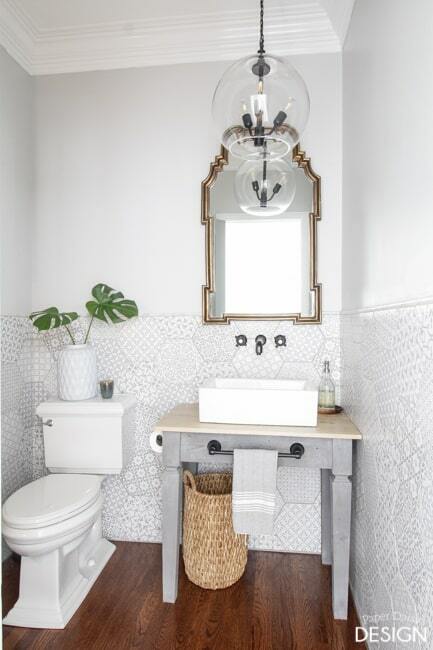 The new sink provided the perfect mix of old and new creating a fresh, timeless powder room. 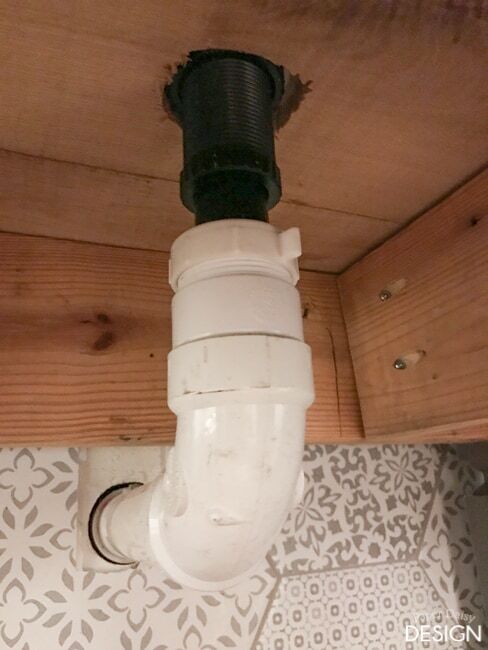 The new ceramic sink is still a bit weighty, so I am happy we added extra support to the structure. So let’s get to the building, shall we? 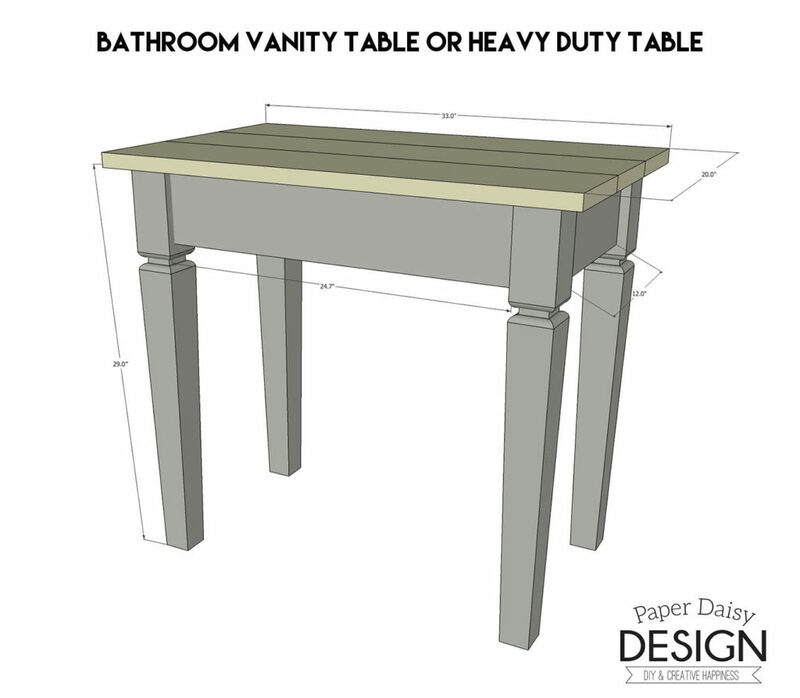 While I’m calling this a vanity or wash table the basic building plan for this could easily be stretched to build a table of any size. 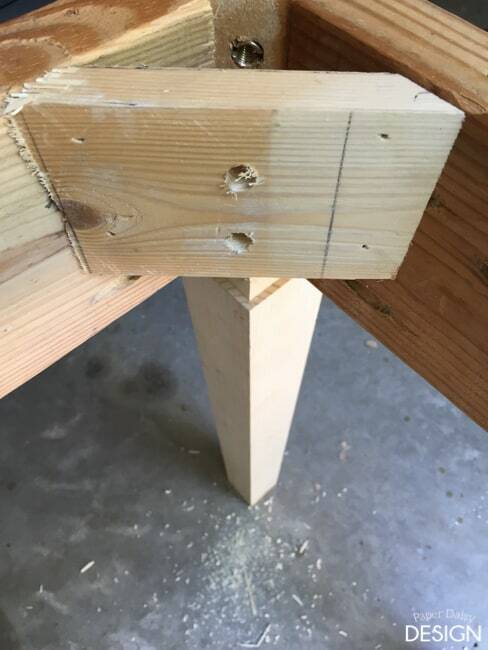 The key change in the building plan for this table, the part that makes it extremely sturdy, is the extra bracing added to the four corners of the table. 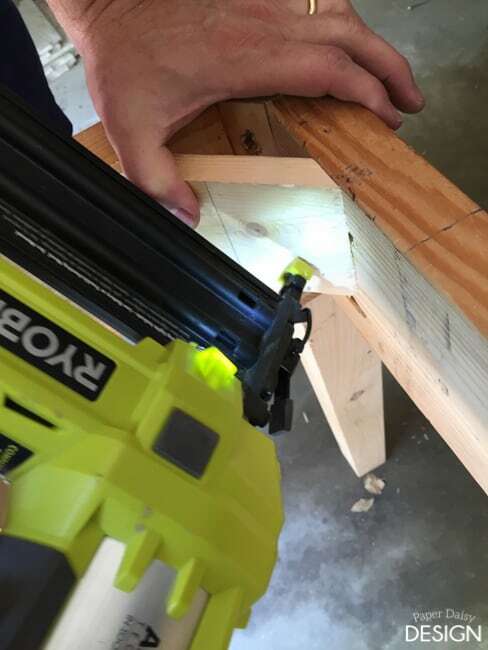 Don’t get me wrong, we totally believe in the durability of the Kreg Jig and actually still used them in this project, but like I said, the table was initially going to support a 50-60 lb sink. 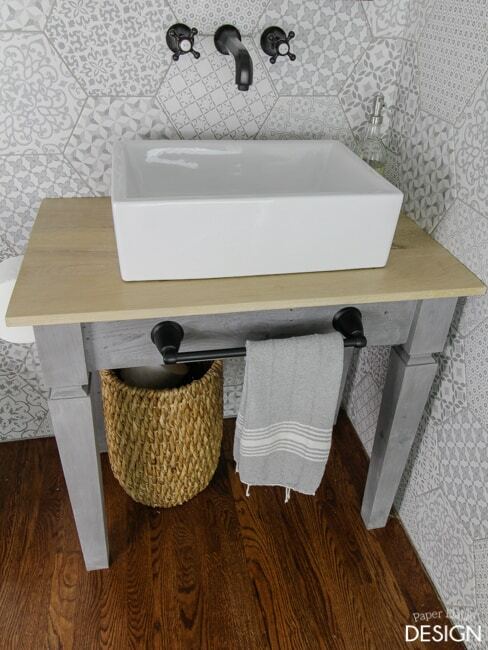 We would much prefer to overbuild than find our table bowing under the weight of the sink. It’s so sturdy I wouldn’t hesitate to stand on it to change the lightbulbs! 2. 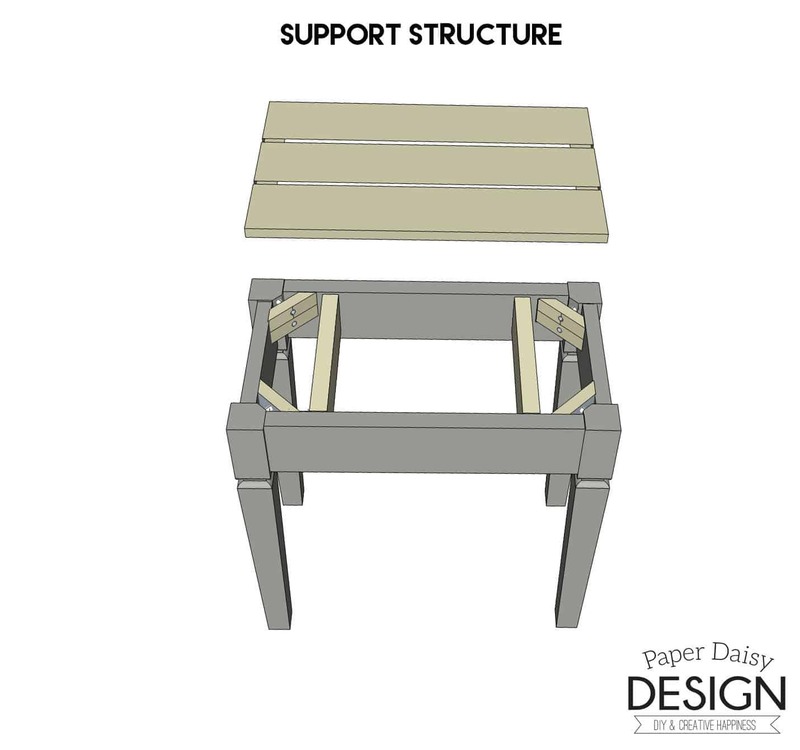 To prep, the legs for the heavy duty support structure, use a square to draw a 1″ line on two sides of the table leg. This will be a guide for an angled notch. 3. 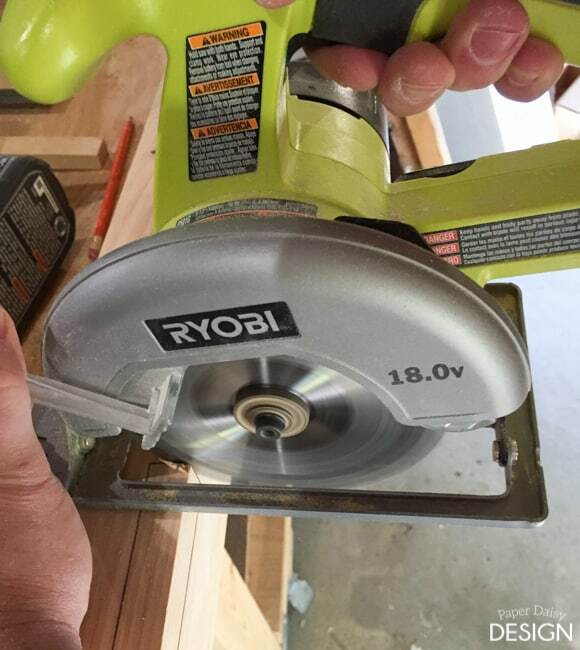 Using a circular saw, carefully cut the inside end straight. 4. 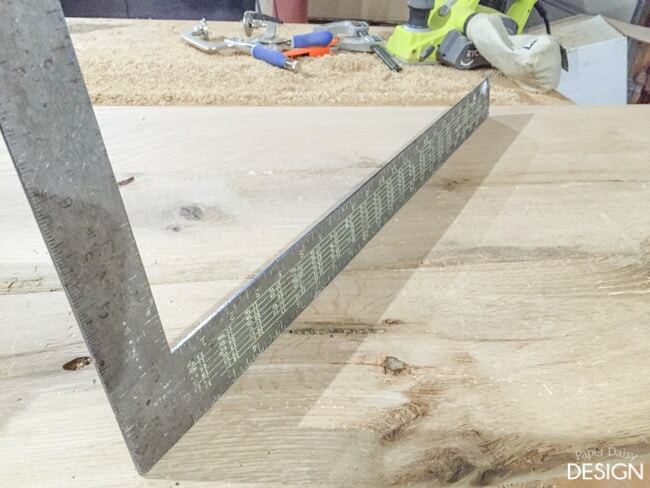 Using a jig saw with the plate turned to 45-degree angle, cut on the guidelines. We tried this on a scrap with the circular saw and were unsuccessful in achieving a proper cut. 5. 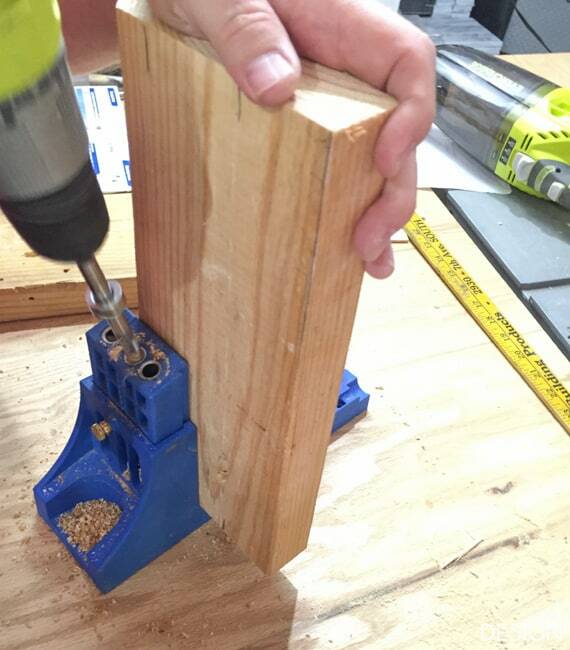 Next drill two holes in the angled side you created to accept threaded inserts. 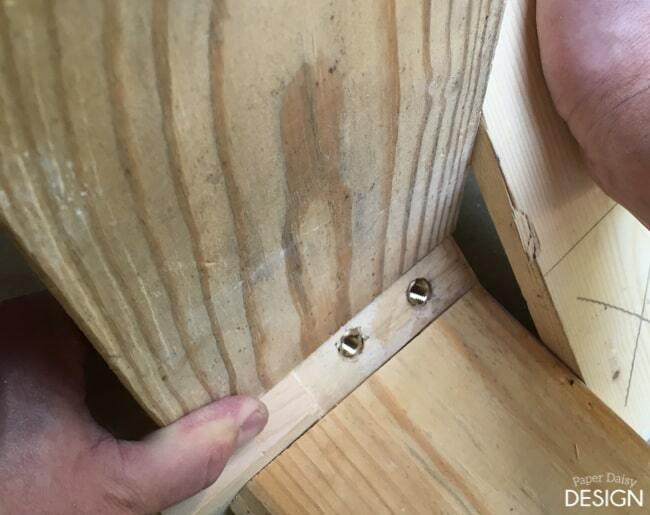 Add wood glue to the hole and use a chisel to screw in the threaded inserts into the holes. 6. 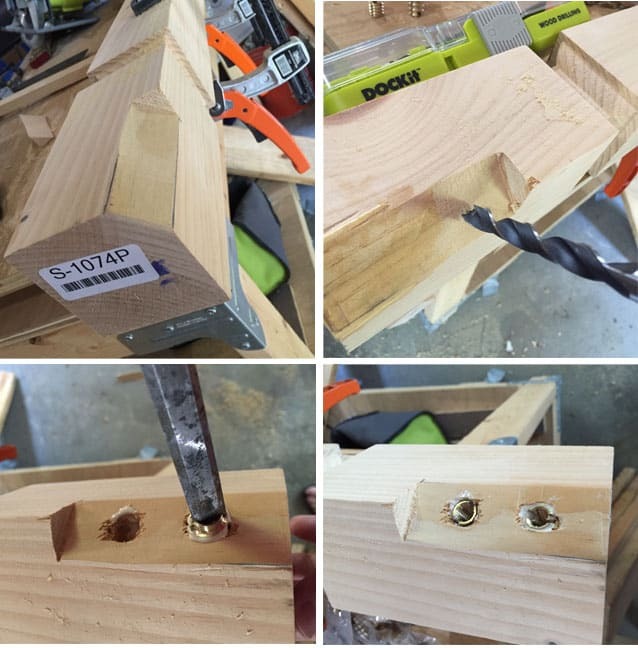 Using a Kreg Jig, make pocket holes in the apron fronts and sides of your table. 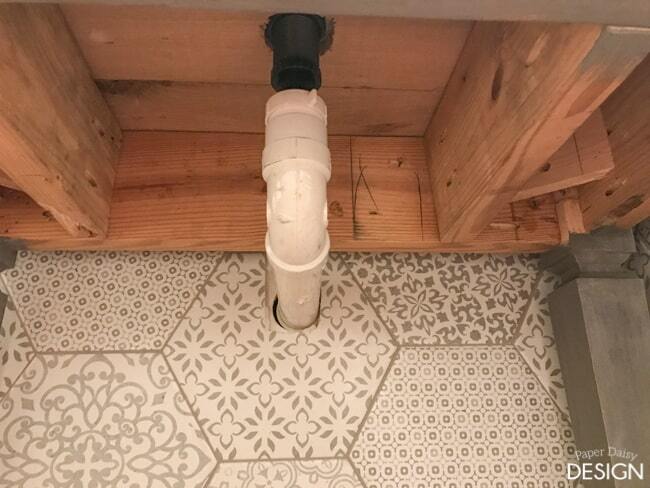 Be sure to mark where the screws will be attached in advance. 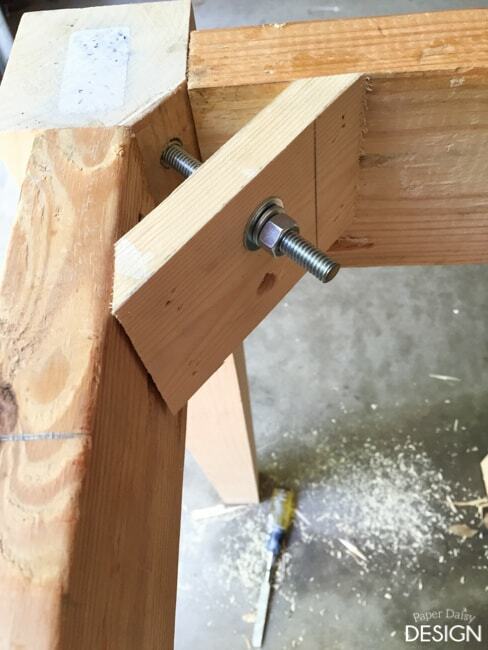 This will ensure you are not trying to drill into an area that already has the threaded inserts. 8. 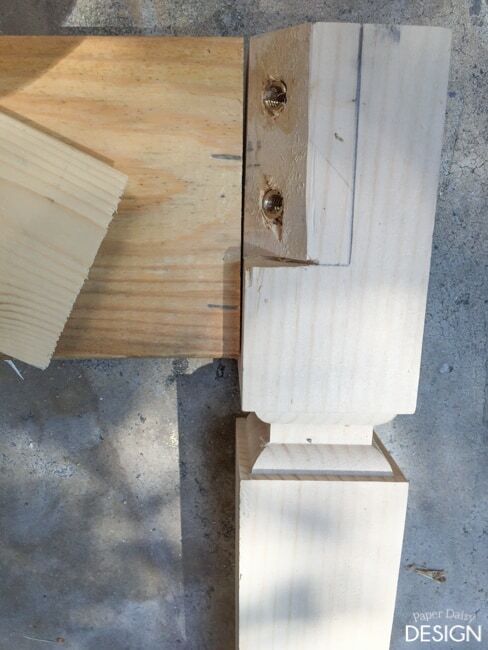 With your apron sides in place use a scrap piece of 1×4 to bridge anchor the sides together. 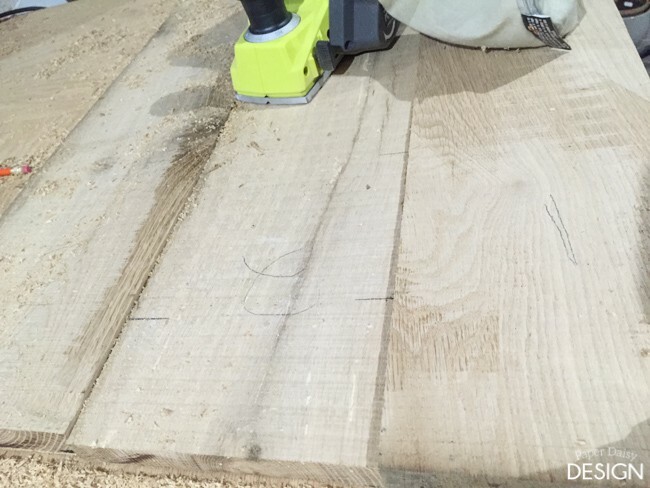 To find the exact length these boards needed to be cut we held them at a 45-degree angle and drew a line. 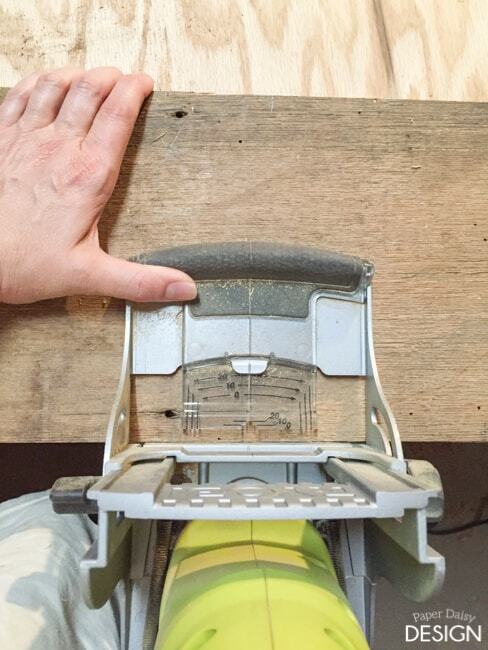 Then we cut the wood on a miter saw to follow that angle. 9. Cut boards to the angle traced. 10. 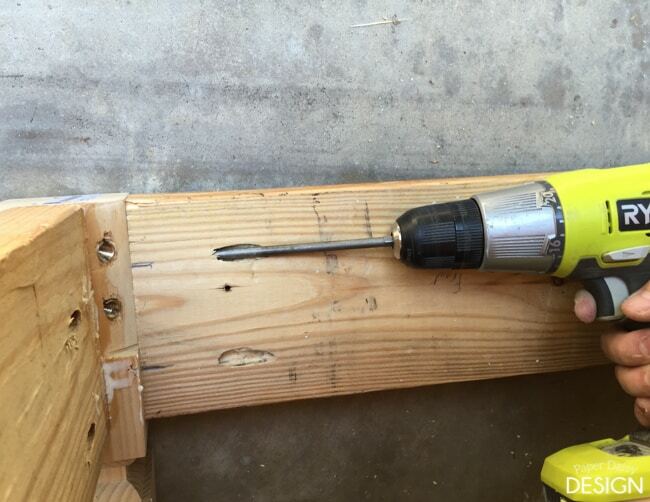 In order to easily attach the boards to the corner insets, nail the boards with a nail gun. 10. Drill holes to line up with the inserts. 11. 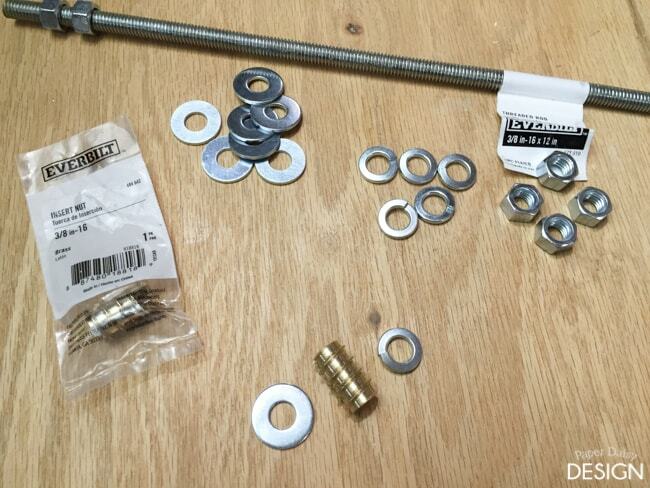 Using the 3/8 inch threaded rod, nuts, washers and bolts, secure the angle brace to the corner. 12. Repeat this process for all four legs. The pea trap is currently in the basement just below the room. The plumber assured us that is to code and I am happy to have no visible pipes. 2. 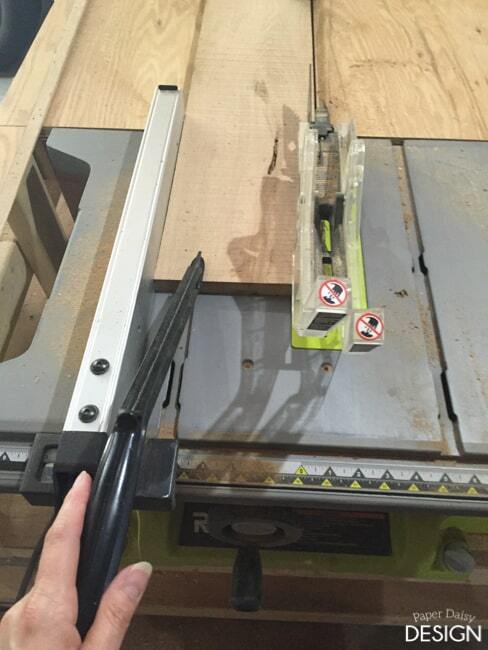 If your boards are not straight, rip them with a table saw to create a straighter edge. 3. 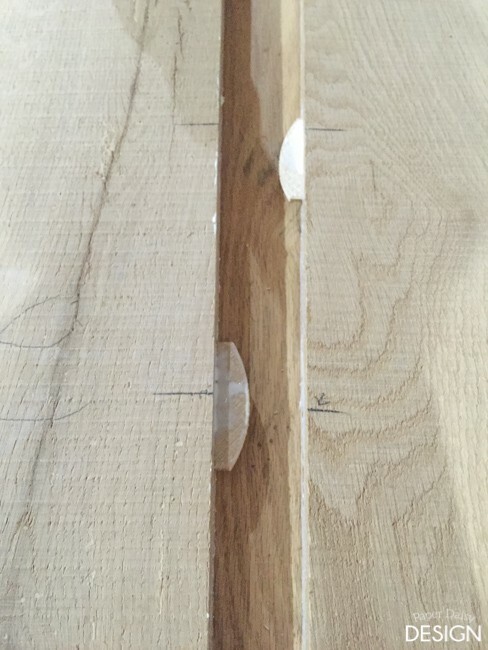 Line up your boards and draw a straight line between connecting boards marking the position of the biscuit joints. 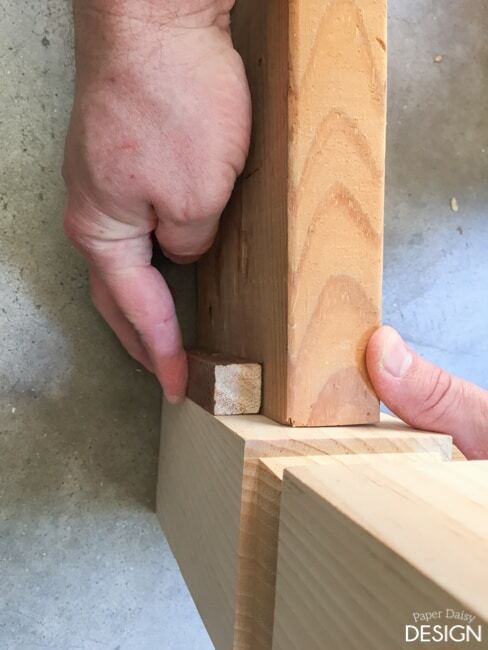 It is a good idea to offset the joints on alternating boards. 4. Using the fence of the Biscuit Jointer, align the guide to the lines on the wood and cut indentations for the biscuits. 4. Repeat this process on all joined sides of the boards. 5. 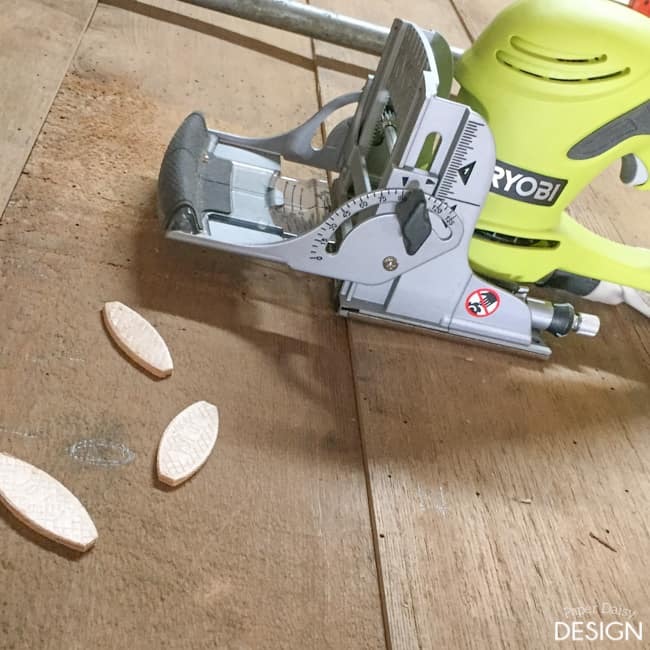 It is extremely helpful, especially when you are dealing with reclaimed wood, to test the joints in sort of a dry run before gluing the biscuits up. 6. 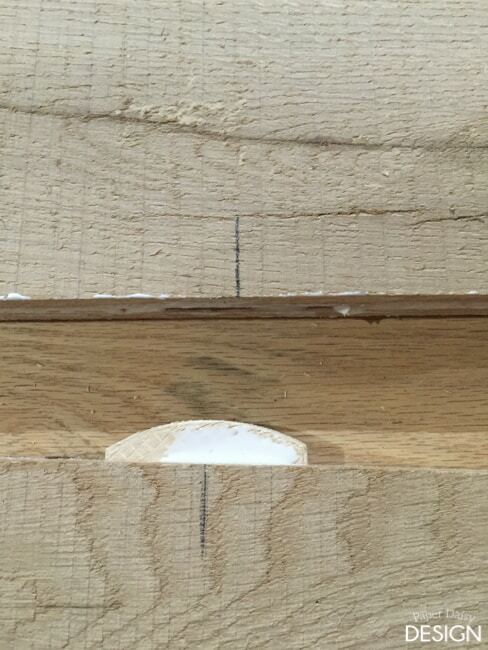 After the joints have been checked, add glue to both the biscuit and the slot. Also, add wood glue all along the edge of the wood. 6. Secure the pieces with clamps and allow to dry overnight if possible. 7. 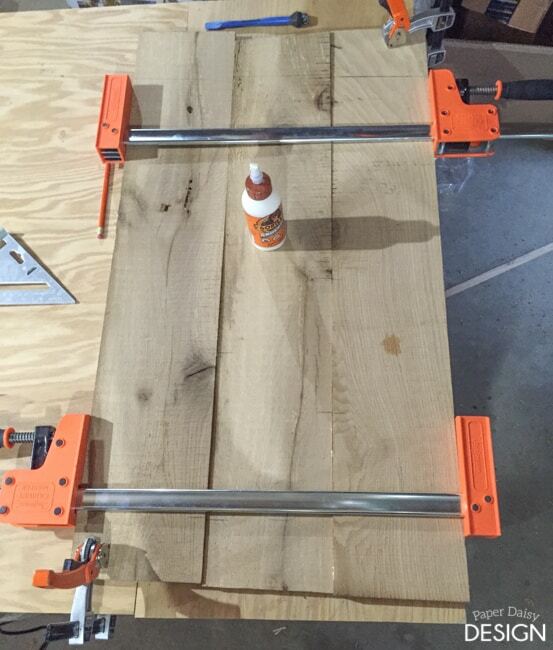 Once the wood is dry, remove the clamps and begin to use an electric hand planer to smooth out the boards. 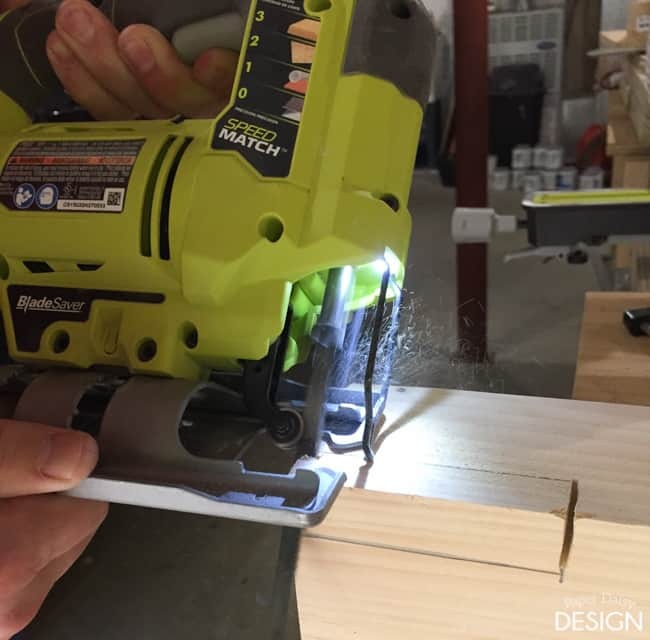 If you are using new wood you will likely be able to skip this step. 3. 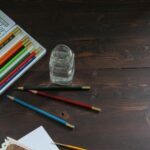 Depending on how rough cut the wood is you may choose to pass the planner over all of the boards to create a level surface and a smooth, finish. 4. 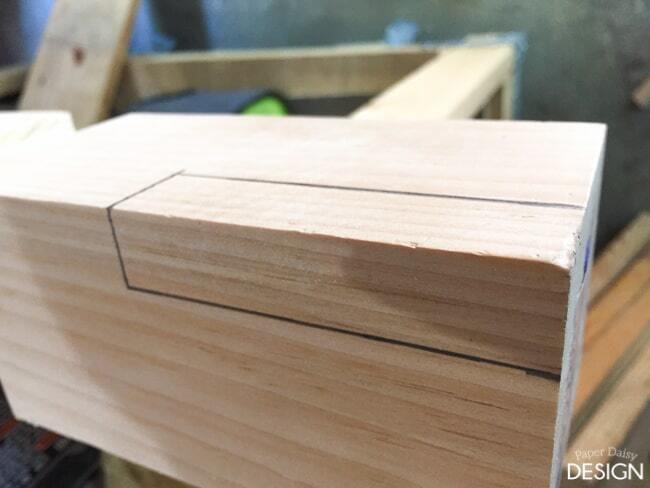 Cut the outside edges of the wood to create a finished edge. 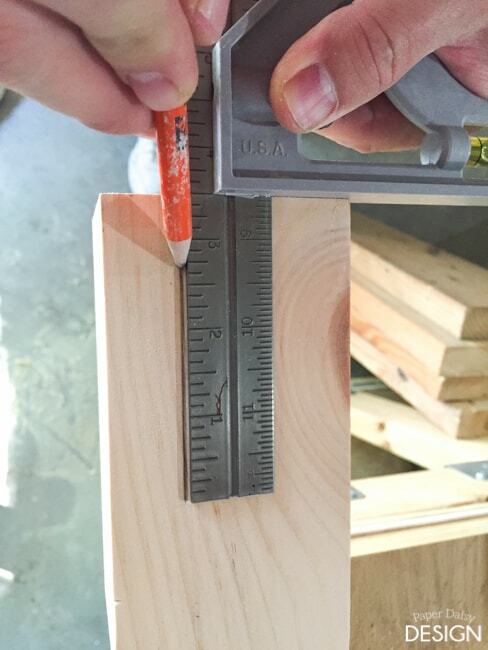 Because our vanity top is fairly small we could easily do this on a table saw. 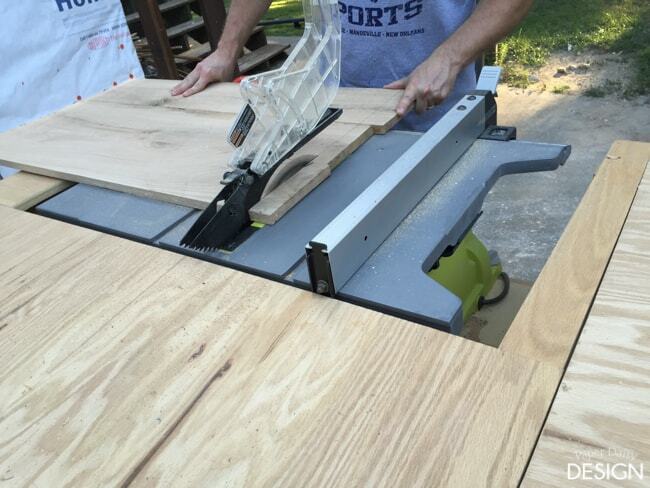 If you are making a large table or countertop, a circular saw is a great option. 5. Sand the wood with increasing levels of sandpaper. I usually start with 80, move up to 120, 200, and finish with 400. 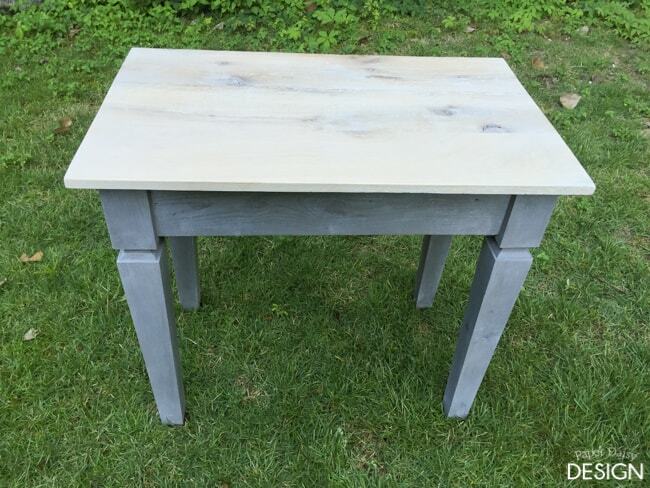 Now you are ready to finish your table and top! 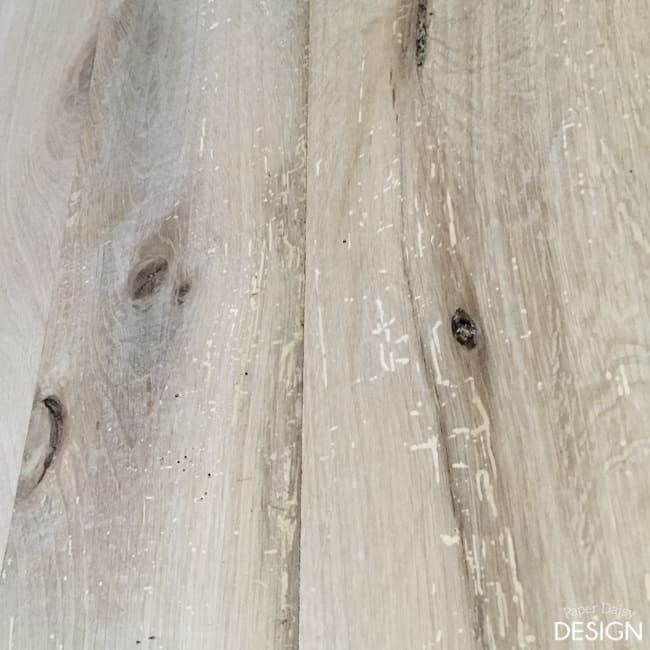 I’ll be posting detailed instructions on the unique finishes I used for my table soon. 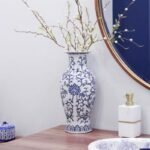 You may also want to check out the reveal post of the powder room here. 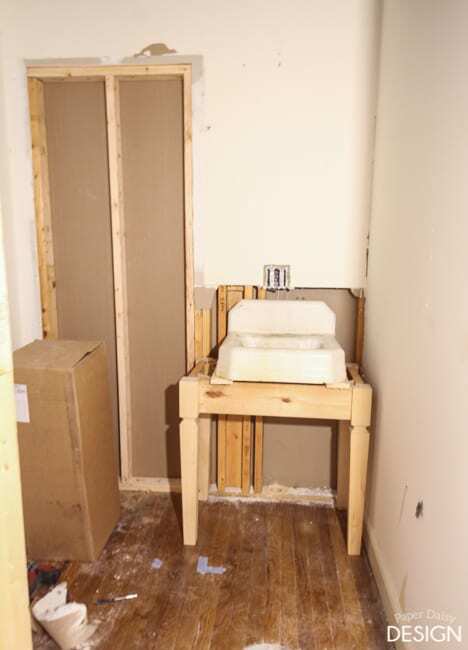 You won’t believe the transformation of this little room. Nice work. I love the finished product! 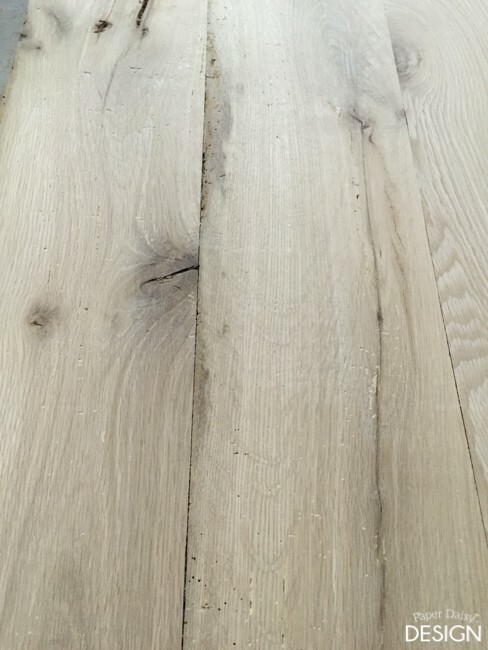 Your tabletop wood looks like it was reclaimed from somewhere… where did you get it? 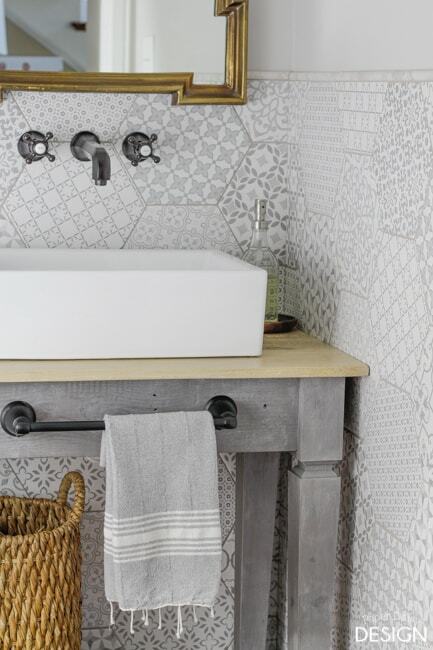 Makes for a really nice rustic, yet contemporary look.